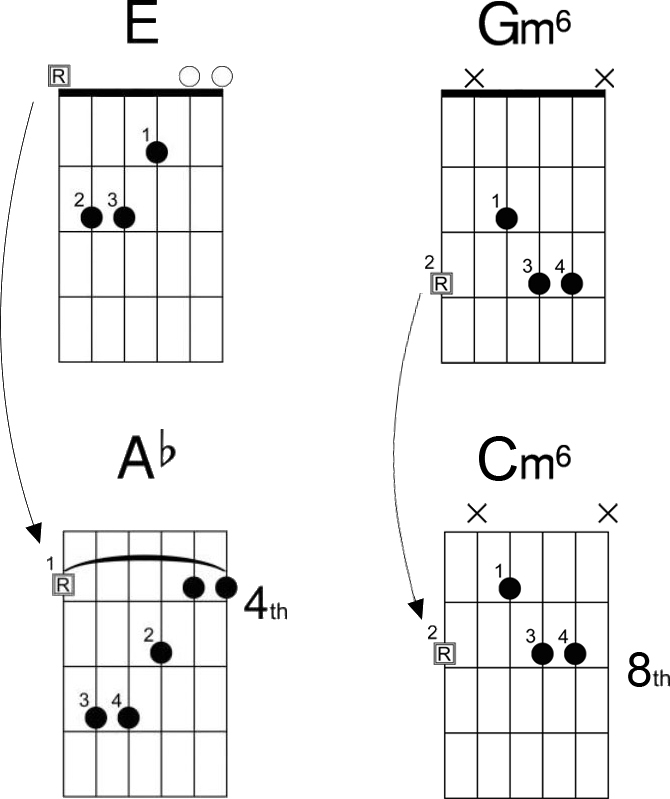 The guitar note chart is useful for finding the root notes for chords, scales or arpeggios. The notes of the 6th, 5th and 4th string marked out in white circles are useful for finding root notes for the CAGED system, while the notes of the 3rd, 2nd and 1st string are in squares to make the diagram visually a little simpler. Let’s say we want to make an A flat major chord using the shape of the E major open chord. Further below is the E major open chord shape. It’s root note is on the 6th string as indicated by the letter “R” in a small square, so this is the string on which we need to find the note of Ab for the root note of an Ab major chord. 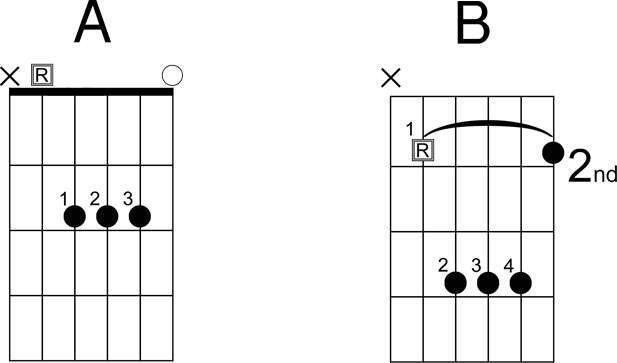 From the guitar note chart we can see that the note of Ab can be found on the 4th fret of the 6th string. Referring back to the E major open chord diagram, notice that below it is our new Ab major chord. An arrow is used between the two chord’s Root notes in order to point out how the Root note has been moved up. The “4th” to the right of the Ab diagram indicates the fret. The curved line on the actual Ab fret-board diagram represents a 1st finger barre, which takes the role of the notes that were previously on open strings for the E major open chord. This works for any chord type. Another example is shown to the right starting with a G minor 6 chord (Gm6) which shape is moved up to make a C minor 6 chord (Cm6). Another example below; a B major chord made from the A major chord open shape. The root note (R) for A major is on the 5th string, so this is the string on which we need to find the note of B for the root note and therefore from where we place the shape for a B major chord. To the right of A major is the B major barre chord.